Whereas linear perspective projects straight 3d lines to straight 2d lines, fisheye perspective projects them to curved 2d lines. This perspective mode has a fixed field of view of 180°. Half of the world is effectively projected onto the view circle. The view circle is controlled by its center point and View Radius parameter. 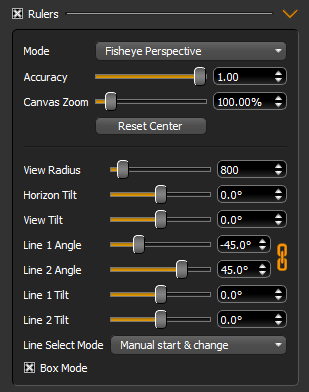 Be sure to set the Image Zoom parameter to your current canvas zoom level. It is also recommended to draw a mark under the center in a separate layer, so you can realign it easily. This mode does not let you change the line angles. You can choose between a horizontal line, a vertical line, and a line going to the view center. Holding the control key will display the measure point unit distance control point, and the freeze mode toggle control point. Clicking on the Freeze Mode control point (or pressing the associated keyboard shortcut) will create a fixed frame of reference at your pen position. Like with the Isometric, Vanishing Lines, and Linear Perspective rulers, you can use this and the measure points to accurately subdivide sections.